This was posted on April 3, 2019 by Sarah Maxwell. I just finished speaking with a sweet mom who placed a telephone order. She was so excited to begin implementing a chore system. She grew up as an only child, with her mom doing all the housework. Her mom felt she was doing her daughter a service by not requiring her to help around the home when in actuality she wasn’t. Our customer shared that now she sees the importance of training children to do chores–it helps to prepare them for life! While it may seem easier at the time to just do it yourself, in the long run, it’s detrimental to the child. They don’t learn important aspects of adulthood such as self-discipline, diligence, responsibility, thoroughness, basic home maintenance, and time management. This mom is energized and excited to begin fresh! Mom wrote an excellent series called Holly Homemaker, which is a 5 part series. I encourage you to read it as you have time if you haven’t already. 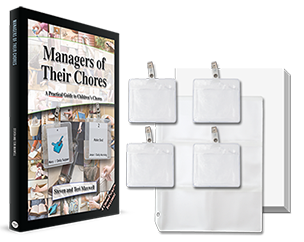 Managers of Their Chores is about to hit its ninth printing and continues to equip moms. The book and included ChorePack kit could revolutionize your family’s chore system. It’s $25, and you’ll receive free shipping (in the United States) since our free shipping bracket is at $25* (some exceptions). Watch my mom (above) share about Managers of Their Chores. One of my sons 11th birthday was yesterday, so we were looking at his baby photo album I had made for him all those years ago. There was a photo in it that was taken in our kitchen of me pregnant with him, and on the wall you can see our chore system and schedule hanging there! It made me smile. We started using your systems years before he was born, I am sure. And we still use them today! Two of the best tools in all of our home school years (20 years and counting!) have been your chore and scheduling systems. Bless you all for letting the Lord use you to have an impact on family’s like ours!!! Thanks so much for sharing! The lady I spoke with yesterday told me she’d wish she had found us years ago. We’re glad that the Lord has used these ministry tools to bless your family. You are an encouragement! the Holly Homemaker series! How I enjoyed those articles! I had forgotten about them, and it was so nice to read them again. I was talking about this very same issue with some of my students: the power of making choices perceived as “different” or “not mainstream”. I always love your encouraging comments! Thank you! I too was one who was raised not being taught to do chores. Raised by a sweet grandmother who felt kids should just “play” and a grandfather who was so particular that the towels had to be folded with corners perfectly squared. This made life as an adult so extremely hard starting out and very difficult to recover from. I see myself as still very slow and unorganized but with a chore system I have learned over the past 10 years not only how to get more production out of myself but to also help my child learn that “work” is part of life and can be a positive thing. Thank you Teri for all you do for us Holly Homemakers! Made me smile, J. Very welcome. So happy you have learned and grown through the years and will send your daughter into life better prepared! Years ago, I found your site while looking for a good way to share household responsibilities among our 3 children. I called on the phone, ordered the system and used it with my children who were 9, 7, and 3 at the time. (I’ve quietly followed your blog ever since) The system was invaluable to us at the time and I remember all of us actually ENJOYING chore and cleaning time! Our children are now 22, married with a new baby of her own, 20, living at home and in college for a nursing degree, and 16 and in high school. They are all responsible, conscientious people who know how to handle chores and responsibilities well beyond simple household tasks. Fast forward several years, we are now parenting our two young sons through adoption, ages 2 and 6. I just pulled Manager of their Chores off the shelf a few weeks ago and have updated the chore cards and revived our system once again. Our mornings are already running smoother. It is as effective the second time around as it was the first. 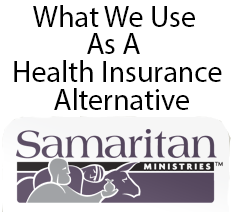 Thank you for such a practical, helpful, easy system that has proved itself over and over again through the years! Wow, we are so glad that Managers of Their Chores met your needs and is something you went back to now with your younger children. Thank you for sharing! I was so fortunate to be raised by parents who taught my brother and I to work. I never knew anything other than we did not get to read, go to into town to see Sitty (Lebanese for Gma), or go outside and play until the chores were done. Most of the time, we all worked together because things were completed faster, and we learned how mom and dad wanted tasks done. Big chores like canning stuff out of the garden, fixing fence, or mowing (which took all day) was a “all-hands-on-deck” until it was done effort. I did the same thing with my kids. Now, I make a list and tape it to the counter in the kitchen, and as each task is completed, it gets crossed off by either me or one of my kids (whoever completes it), and we move to the next task. Large task are done together simply because it is easier, and having someone to talk to passes the time. To this day, there is nobody I would rather work side by side with than my kids or my brother. What a blessing your parents were to you by encouraging you to work, and then you have passed that on to your children! I agree that working together is enjoyable – great fellowship and the task is accomplished more quickly.